Korea is known for its plethora of cutting edge beauty products (among them, fermented snail anti-ageing potions*!) but not being able to read labels and know exactly what I’m putting on my skin, I was reluctant to try much on my travels there this past week. Here’s what I picked up instead, complete with wrinkly sheet background to show you what it’s for. Well, actually I suppose that’s a bit misleading. It is not for smoothing sheets. 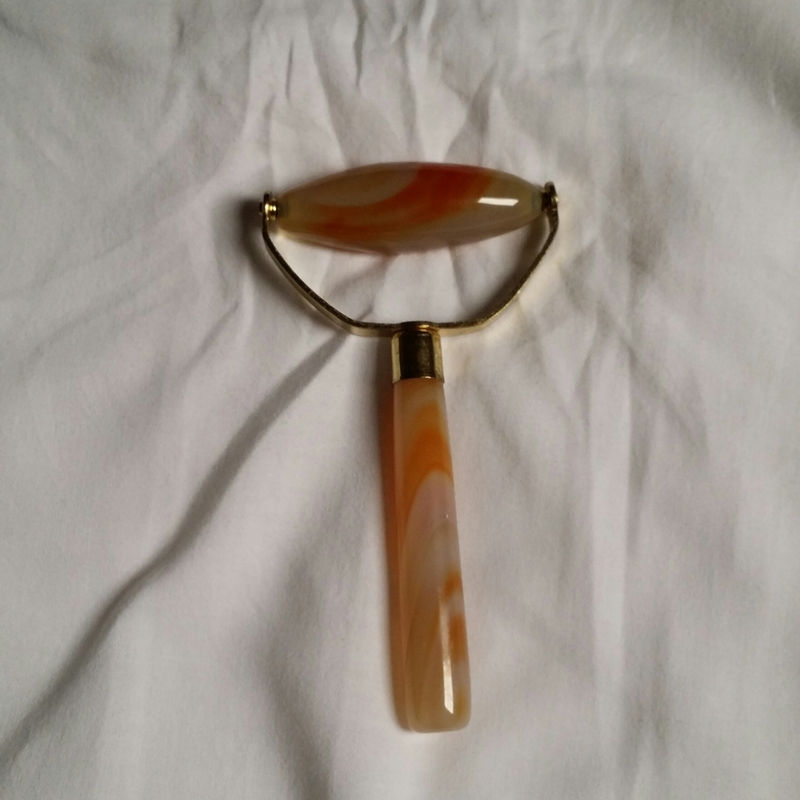 This is a roller for facial wrinkles. At the start of the year I had some acupuncture and massage treatments on my face in an attempt to slow gravity’s ever-faster march. I don’t know whether I got results as I ran short of cash so didn’t really keep going with the treatments, but the first time the acupuncturist used one of these rollers on my face (she used a jade one which is more common as it’s meant to cool the skin and close pores, I think – I couldn’t find jade when the urge hit me to buy one, so this is carnelian) I was surprised at how tight my muscles were. If you think about it, your face gets a pretty good workout even if you’re a crazily happy person, and if you’re stressed then of course muscles get tense from frowning. 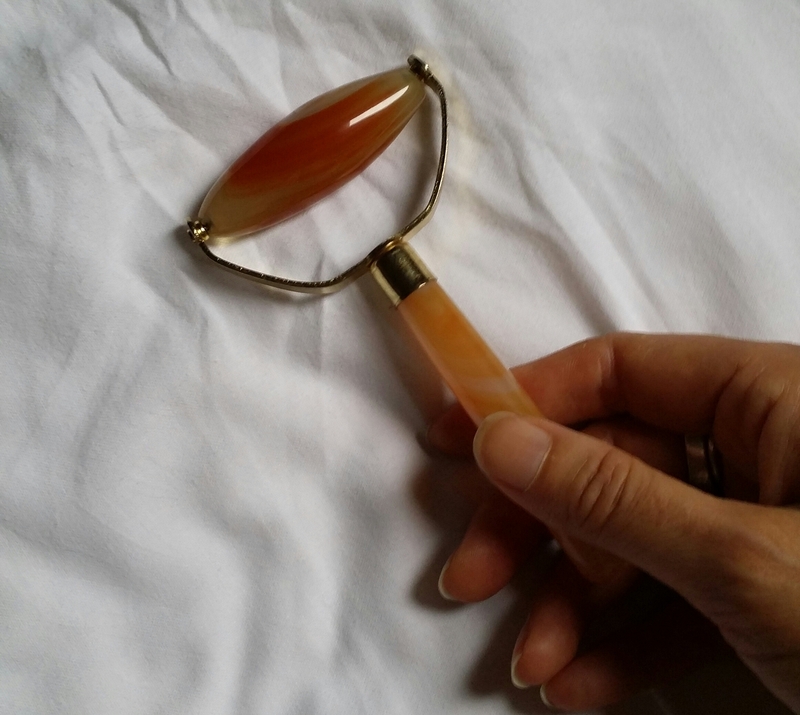 Although you can do face massages with your fingers, I liked the idea of this face roller – it’s kind of an old-school piece of equipment although very popular with Asian ladies even today. I plan to make DIY face massages part of my beauty routine – not sure whether any wrinkles will get rolled out but any increase in circulation has to improve skin tone, right? Plus, taking a few minutes to do this will hopefully be kind of meditative too, so even if there’s no other benefit I might get a touch more mindful. If you’re interested in trying one of these rollers, you can probably find one in your local Chinatown – I’ve seen quite a few of them at markets across Asia although I got this one in a gemstone shop in Insadon, Seoul. It cost about $20 but they probably vary depending on the quality of the stone (really high level jade would run into the hundreds of dollars, I’d presume). Make sure you look up which direction to massage, you can probably find videos on YouTube, although as a general rule, work from the centre of the face outwards and upwards.